Is anyone else wondering how it’s August already? After some morning blog reading, I’ve suddenly realized that everyone else has gone (and come back from!) a summer vacation and we somehow forgot to plan one of our own. We’ve been talking about a number of trip ideas since last winter but that’s just the problem – it’s been all talk. Talk followed by excuses, followed by projects and general life busy-ness. So… help? What would be a fun trip for late August/early September? I’m drawing a blank and would love some suggestions. It could be near or far… preferably with temps less than 100 degrees… and of course someplace with great food! 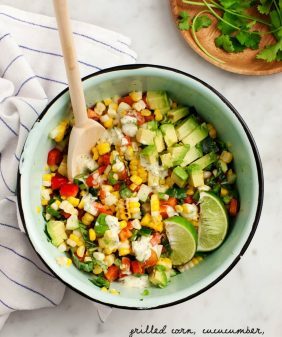 Speaking of 100 degrees – this has become my favorite “it’s way too hot out” refreshing summer salad. Any stone fruit will work here, but lately I’ve been savoring the last of Texas peach season. I just love this combo of juicy peaches, peppery arugula and creamy greek yogurt dusted with ground coriander and crushed pistachios. Make it a full meal by serving it next to some simply-grilled fish. Or try tossing in some chickpeas or other veggies you might have on hand. (I used thinly sliced zucchini here, but it’s also delicious with ribbons of peeled carrots). It’s also great for a quick throw-together lunch if you mix up the yogurt ahead of time. In a small bowl, stir together: greek yogurt, a drizzle of olive oil, a squeeze of lemon, a pinch of ground coriander, salt & pepper. Chill until ready to use. 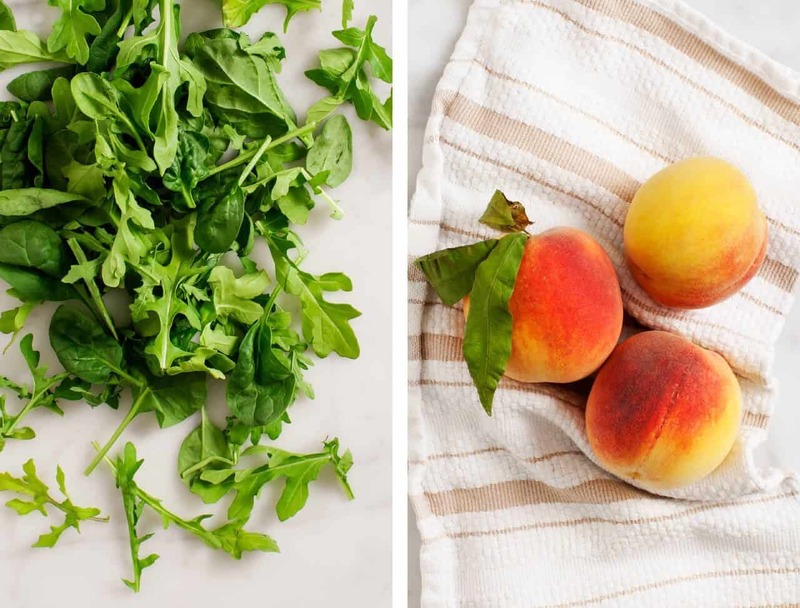 Toss arugula with a little bit of olive oil. Place it into 2 shallow bowls and top with zucchini slices, peaches, mint, a dollop of yogurt, a small dusting of coriander, crushed pistachios, salt and pepper. I use this julienne peeler for my zucchini, you could also slice thin ribbons with a regular vegetable peeler. This sounds delicious! 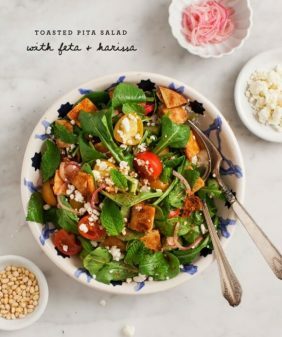 I have just finished making all sorts of peach things in my kitchen this morning but I still have a few ripe ones left and am strongly considering this salad for dinner. It hasn’t been a hot summer here in Ontario Canada at all (in fact, it kinda feels like only just arrived – July was super rainy!) but I’m still trying to get as many peaches in as possible before they’re gone. Stunning photos! You’re weather in Ontario sounds similar to ours in Buffalo. Cool and Rainy. Agree, this looks delicious! i have been trying to figure out what to do with all the mint from the garden! Trying to share on FB but the link doesn’t seem to work. Looks wonderful! hmm… just checked and it’s working for me – maybe refresh your browser and try in a minute? First of all I’ve gotta say, I just love your photography… the backgrounds, the bright vibrant colors, the angles… swoon. 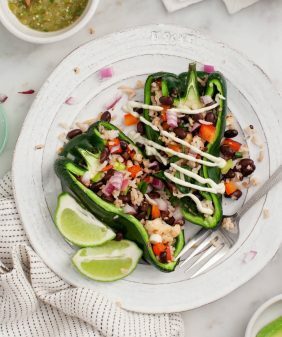 Second, this salad is right up my alley!! 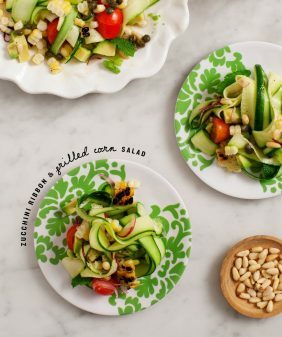 Love peaches, LOVE pistachios, love spiralized zucchini… ok, you’ve convinced me… I’m making this tomorrow! Ha, I had to laugh at your comment. Yes, I was wondering how we got to August already too. Maine would probably be lovely at this time, plus staying in a cabin in the woods you’d hopefully get to forage for wild blueberries. 😉 Or you could come to Switzerland, it’s definitely a lot cooler here. We’re not having much of a summer. 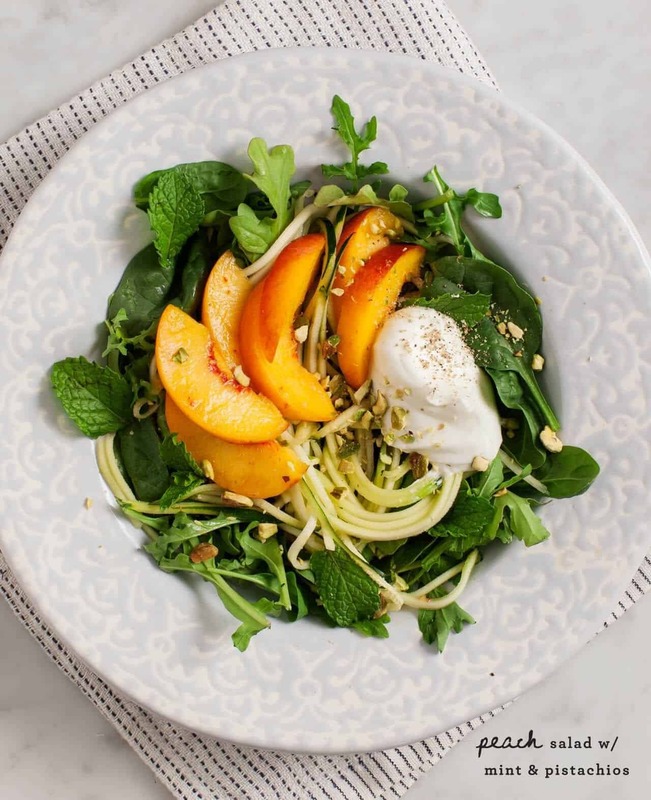 But we do have peaches, and I love the looks of this salad with the zucchini noodles. What about comungar to Galicia (Spain). Mild weather, nice nature and of course wonderful food! !you are always welcome!!!! This salad is beautiful – I love using fruit in savory salads. As for vacation ideas – Northern California is always a good idea. Don’t come here (Houston). I think we are finally ramping up to see the 100’s. We just got back from Laramie, Wyoming. If you like hiking (or mountain biking or fishing) you should try it. In Centennial stop by the Mountain View Hotel, they have a great little cafe. In Saratoga check out the microbrewery at the Saratoga Resort and in Laramie have breakfast at the 17th Street Cafe and dinner at Jeffery’s Bistro. Just discovered your site (lovely!) looking for tortilla-making advice. Found what I was looking for, and then some. For vacation ideas I would be remiss if I didn’t mention the Minneapolis / St. Paul area . . just wait for the weather to cool down a bit. I lived there for 27 years and was never lacking in finding interesting things to do or fabulous places to eat. Then there’s Portland . . .
It’s monsoon time here in Mumbai so visiting places like Lonavala and Khandala would be the best time to see some intensely green landscapes with milky white waterfalls, breezy winds and then indulge in the local tea and fritters, Indian version of brittles called ‘chikki’ and some super cool fudges atop hills, forts and mountains. Almost like a trek // hike so it is pretty adventurous ! 😀 This salad loaded with peaches is making me reach out to my screen!!!! It looks DELISH! Love the addition of Greek Yogurt and pistachios! For a trip with delicious food, I’s day that Italy is always a good idea! And in September, it will be a little more quiet I think. Last year I spent a few days in Cinque Terre but I think anywhere on the coast would be great. You coul also try Malta or do a cruise around Greeks Islands. Lisboa is fantastic too! The coast of South West France (Pays Basque and Landes, up to Bordeaux and the islands of Oléron and Ré) are very beautiful too. I don’t know Spain very well, but I’m prtty sure there’s very much to do there (and the food will be awesome too! ), just avoid the innerlands and the souths that can be very hot! For a less Southern experience, I’d say that Belgium, Netherlands, or Scandinavia (I love Copenhaguen! ), or even the coast of Northern Germany would be great. I also imagine Estonia as a beautiful and welcoming country. 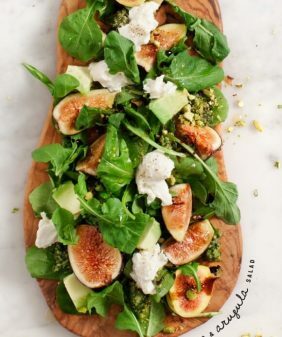 Love the simplicity of this salad! Looks great! This salad looks amazing. We too have been thinking and talking about a vacation and I have voted on Napa for the fall. Love the food and wine that Napa has to offer. For your trip – I’m thinking somewhere up north to get a little relief from the weather. What about Montreal or Boston? Both really fun places to visit that shouldn’t be too ridiculously hot. And both have delicious food! I’ve just discovered your blog lately and I like it a lot. Everything you prepare looks great (and tastes as well). So thank you for that! As for your vacation – I’m not sure how far you are prepared to travel, on what budget and what type of a holidaymaker you are, but perhaps you’d consider visiting my home country – Slovenia (Europe). Even though I’ve travelled (and saw) a lot of the world, I still find myself quite lucky to live here – mainly owing to the beautiful landscape and variety of activities one can carry out. That “juliane peeler” is awesome! Making this tonite! I bought the ingredients over my lunch time so I could make it. Suggest a lovely time in Victoria or Vancouver BC, or Seattle area. The fruit (berries) and seafood is phenomenal – I love Montreal on the other end as well..
Wow, almost peach time! 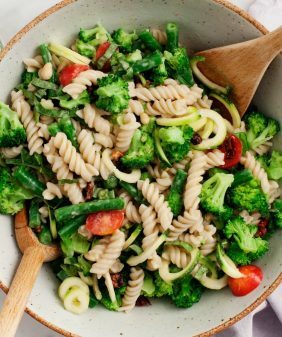 Just pinned this recipe for early summer. Thank you!